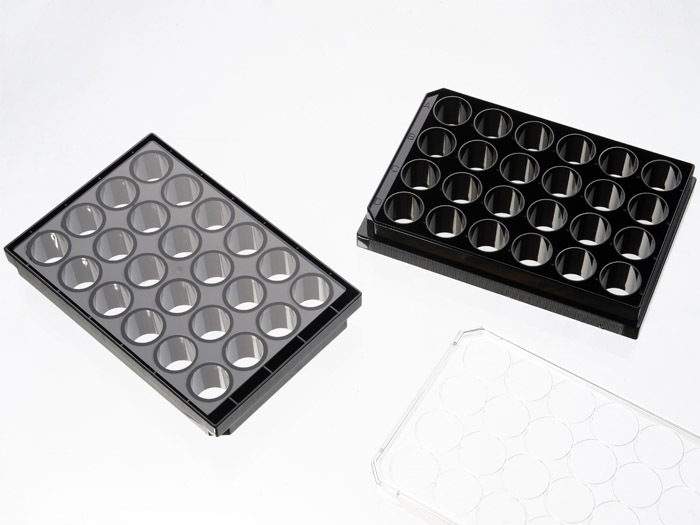 24 well glass bottom plates are suitable for assays with medium to large sample size. 24 well plates are made from virgin polystyrene. Quote: "Samples were submerged in the staining solution and incubated for 20 minutes before being transferred upside down into the wells of a glass bottom 24-well plate (CellVis) filled with 250 μl of PBS." Quote: "Cell imaging was performed using 24-well glass bottom black plates (Cellvis) in an Operetta automated imaging system (PerkinElmer) at 40x magnification equipped with a temperature control chamber"
Quote: "For the unsorted cell experiment, H460 cells were plated in a 24-well optical glass-bottomed plate (P24-0-N, Cellvis, CA, USA) at 1 x10 4 cells/ml with a total of 1 ml of medium (DMEM described above) in each well." Quote: "Time-lapse microscopy: Cells were plated in a 24-well glass-bottom imaging plate (Cellvis, USA) and cultured in a phenol red–free CO2-independent medium (Invitrogen) supplemented with 10% FCS"
Quote: "Live cell imaging: Stably transfected U2OS-TFEB-eGFP and MCF-7-TFEB-eGFP cells were plated at 40% confluence in 24-well glass bottom plates (In Vitro Scientific, CA, USA)"
Quote: "BAT SVF cells stably expressing Mito-roGFP were seeded in 24-well plates with high performance #1.5 cover glass bottoms (Cellvis #P24-1.5H-N),"
Quote: "Cells stably-expressing the corresponding GFP- or mCherry-tagged proteins were seeded on 24-wells glass bottom plates (Cellvis) and transfected with the corresponding siRNA." Quote: "Immunofluorescence (IF) staining: IF staining was done on cells grown on 24-well Glass Bottom Plates (In Vitro Scientific) as described "
Margarete Diaz-Cuadros, et al., BioRxiv November 04, 2018. Quote: "except cells were seeded on 35 mm matrigel-coated glass-bottom dishes (MatTek cat. no. P35G-1.5-20-C) or 24 well glass-bottom plates (In Vitro Scientific cat. no. P24-1.5H-N). DMEM/F12 without phenol red was used to reduce background fluorescence (Gibco cat. no. 21041025 )." S Feng, et al., BioRxiv, October 25, 2018. Quote: "24-well plates with #1.5 glass coverslip bottoms (In Vitro Scientific) and transfected ~24 hours before measurement using GenJet transfection reagent (SignaGen Laboratories) according to the manufacturer&#039;s instructions"
View all 59 publications citing "24 Well glass bottom plates"